The Integrated Licensing Process (ILP) is the default process used to license hydropower projects. However, developers may request use of the Traditional Licensing Process (TLP) for their project. The Office of Energy Projects within the Federal Energy Regulatory Commission (FERC) oversees the licensing process as authorized by the Federal Power Act. 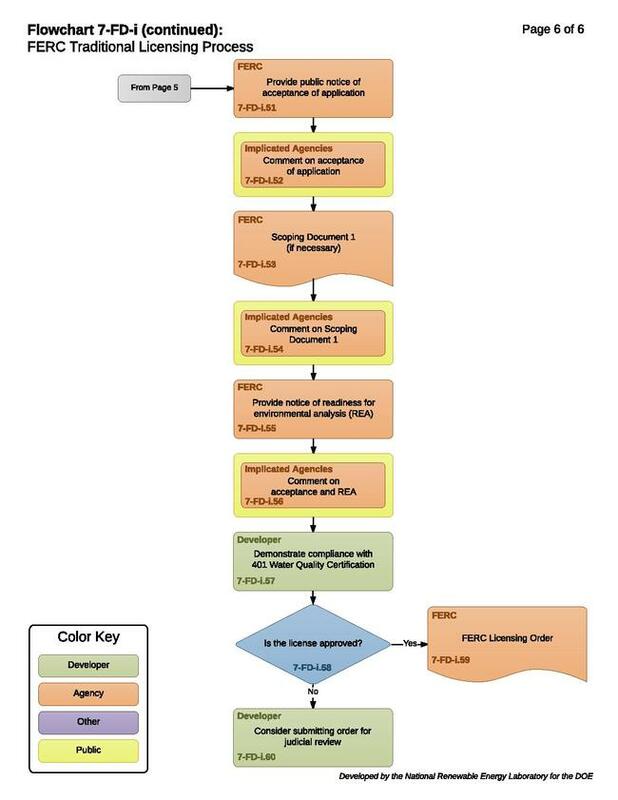 FERC may approve the use of TLP for projects with less complex issues, where involvement in the study plan development process may not be necessary. Developers often wish to use TLP to avoid the strict schedule of the ILP so that they can move through pre-filing quicker or have time to develop a settlement agreement with interested parties. The TLP is a notice-and-comment process that involves three stages of consultation with agencies implicated by the project. Other factors believed by the developer to be pertinent. The developer must provide a copy of the request to all affected resource agencies, Indian tribes, and members of the public likely to be interested in the proceeding. 18 CFR 5.3(d)(1). Under Section 401 of the Clean Water Act (CWA), a federal agency may not issue a license authorizing the construction or operation of a project unless the appropriate state agency first issues a water quality certification for the project or waives certification by failing or refusing to act on a request for certification within a reasonable period of time. 33 USC 1341(a)(1). In order to allow the state agency sufficient time to analyze the impacts of the project on water quality and to meet the deadline for demonstrating compliance with Section 401 of the CWA, the developer may request water quality certification from the appropriate state authority early on in the FERC licensing process. 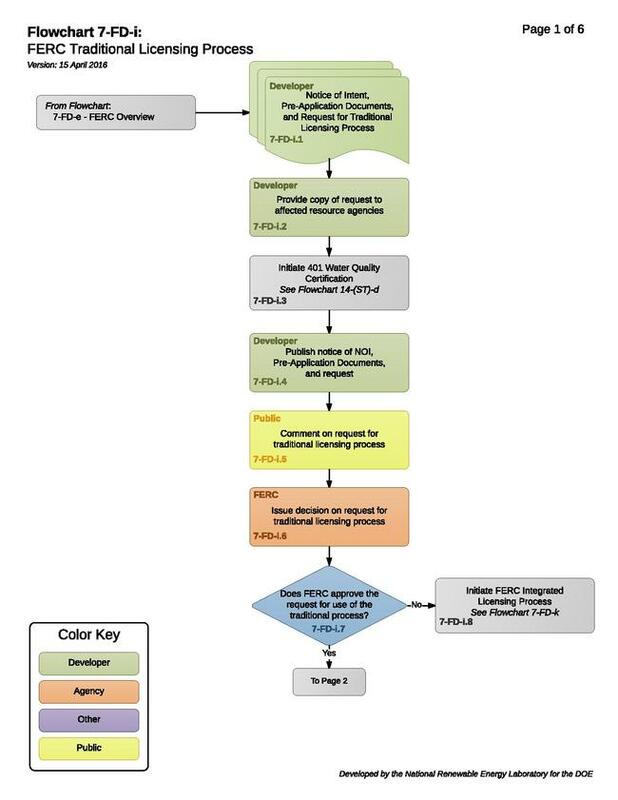 Include a statement that comments on the request to use the traditional process are due to FERC and the potential developer no later than 30 days following the filing date of that document and, if there is no project number, that responses must reference the developer’s name and address. Any person may submit comments on the request for the TLP within 30 days of the filing date of the request. The notice will specify that comments on the request to use the TLP should address the likelihood of timely license issuance, complexity of the resource issues, level of anticipated controversy, relative cost compared to the integrated process and any other factors that the commenter believes are pertinent. FERC Handbook, page 4-3. FERC usually issues a decision on any request to use the TLP within 60 days of the filing of the notice of intent. FERC Handbook, page 4-3. 7-FD-i.7 to 7-FD-i.8 – Does FERC Approve the Request for Use of the Traditional Licensing Process? FERC may grant requests to use the TLP if they find good cause shown by the developer. If FERC does not approve the request for use of the TLP, the developer will initiate the ILP. Any statement required by 18 CFR 4.301(a). The developer must provide public notice of the consultation meeting and site visit. The developer must provide FERC with written notice of the meeting’s time, place, and agenda at least 15 days before the scheduled joint meeting date. The developer must provide public notice of the meeting arrangements and agenda in a daily or weekly newspaper in each county in which the project is located. 18 CFR 4.38(g)(2)(i). Agree on a time frame and format for discussion of study results. Under the Endangered Species Act (ESA) section 7(a)(2), FERC must ensure that any action it authorizes, funds, or implements is not likely to jeopardize the continued existence of listed species or result in the destruction or adverse modification of a designated critical habitat. If the project will adversely affect a threatened or endangered species of fish, wildlife, or plant, then the FWS or NMFS may establish reasonable and prudent alternatives (RPA) or measures (RPM). FERC is not required to include the measures in a license, but FERC and the developer may be held liable for any damage to a listed species that results from the license. Due to this, FERC treats RPA or RPM as mandatory conditions included in the license. FERC Handbook, page B-2. Explanation of how the studies and information requested will be useful to the agency, Indian tribe, or members of the public in furthering its resource goals and objectives as related to the project. Following the required consultations, the developer with the assistance of participating agencies will have completed a set of resource-by-resource study plans and detailed documentation of the consultations. FERC Handbook, page 4-7. 7-FD-i.18 – Has a Study Dispute Been Filed? Any participant and the developer may disagree on the need or method of a study. Any dispute may be referred to FERC for resolution. 7-FD-i.19 – Has the Dispute Been Referred to FERC for Resolution? If the developer and a resource agency or Indian tribe disagree as to any matter arising during the first stage of consultation or as to the need to conduct a study, then the dispute may be referred to FERC for resolution. 18 CFR 4.38(b)(6). The entity referring the dispute to FERC must serve a copy of its written request for resolution on the disagreeing party and any affected resource agency or Indian tribe, which may submit a written response to the referral within 15 days of the referral’s submission. 18 CFR 4.38(b)(6)(ii). FERC will resolve the disputes by letter provided to the developer and all affected resource agencies and Indian tribes. 18 CFR 4.38(b)(6)(iv). The developer must implement the approved study plans once all disputes have been resolved. 7-FD-i.23 to 7-FD-i.24 – Is an Additional Study Requested? 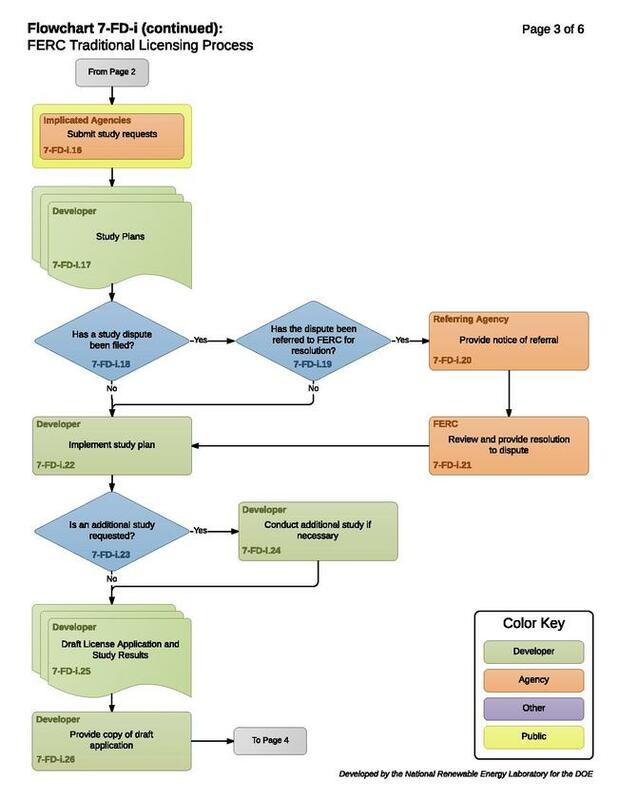 If a participant requests an additional study, then the developer must promptly initiate the study unless the study is unreasonable or unnecessary for an informed decision by FERC on the merits of the application or use of the methodology requested by a resource agency or Indian tribe for conducting the study is not a generally accepted practice. 18 CFR 4.38(c)(2). Include a discussion of the study results and any proposed protection, mitigation, and enhancement measures. FERC Handbook, page 4-9. Note, FERC may review the Draft License Application and Study Results, pending on workload. Responds to any comments and recommendations made by any resource agency and Indian tribe either during the consultation process. Resource agencies and Indian tribes will have 90 days from the date the developer provides the copy of the draft application to comment on the application. 18 CFR 4.38(c)(5). Where the project will be located on a federal reservation, the federal agency responsible for managing that land can file conditions to protect the reservation, and these conditions are required to be included in any license issued. For example, The Forest Service (FS) may require that a license for a project occupying lands or waters of a National Forest include those conditions necessary to assure the protection and use of the affected resources. United States Department of the Interior Memorandum M-37005. A national forest is considered a “reservation” for purposes of FPA Section 4(e), and FS is authorized to impose mandatory conditions on the project license. 16 USC 796(2). FERC must ensure that the project is best adapted to a comprehensive plan for developing the waterway for beneficial public purposes. For example, The NPS has submitted the Nationwide Rivers Inventory as a comprehensive plan with FERC. NPS may then submit conditions to FERC for consideration under FPA Section 10(a) to ensure that the project is best adapted to the Nationwide Rivers Inventory. FERC List of Comprehensive Plans. The U.S. Fish and Wildlife Service (FWS), the National Oceanic and Atmospheric Administration's National Marine Fisheries Service (NOAA Fisheries), and state fish and wildlife agencies will develop preliminary conditions for inclusion in the license pursuant to section 10(j) of the Federal Power Act. The agencies are responsible for filing any preliminary fish and wildlife recommendations, prescriptions, conditions, and comments, to be submitted in final form after the filing of the application. FERC Handbook, page 5-5. FERC will include these measures unless it finds them inconsistent with the FPA or other applicable law. FERC likely could avoid 10(j) disputes if the ALP application contains consensus for the proposed protection, mitigation, and enhancement measures. FERC Handbook, page 4-14. The Secretaries of Commerce and the Interior can prescribe mandatory fishways at licensed projects, and those conditions are required to be included in any license issued. For example, the NMFS may require acceptable fishway prescriptions to safeguard certain species of fish from changes in waterflow that degrade their habitat. NOAA Hydropower and Fish Passage webpage. The agency must specifically identify and explain the mandatory terms and conditions or prescriptions and their evidentiary and legal basis. 18 CFR 4.34(b)(1). A statement waiving the agency’s right to file the terms and conditions or prescriptions or indicating the agency does not intend to file terms and conditions or prescriptions. The Bureau of Indian Affairs (BIA) typically issues FPA section 4(e) conditions or 10(a) recommendations, as appropriate, where a project is located on tribal lands, a tribe has an interest in the area where the project is located, or a project may interfere with the purpose of a reservation. The BIA may also participate by engaging with fish and wildlife agencies responsible for developing section 10(j) recommendations. The Bureau of Reclamation (BOR) typically issues FPA section 4(e) conditions or 10(a) recommendations, as appropriate, for projects that are located on or may otherwise affect a BOR facility. The National Park Service (NPS) typically issues FPA section 4(e) conditions or 10(a) recommendations, as appropriate, for projects that are located on federally-reserved NPS lands, projects that may affect NPS-managed lands, and projects that may affect recreational interests in non-NPS lands. The United States Forest Service (USFS) typically issues FPA section 4(e) conditions or 10(a) recommendations, as appropriate, where projects are located on National Forest Service lands or may adversely affect National Forest System resources. 7-FD-i.30 – Is there a Substantive Dispute that Must be Resolved? The developer will be required to participate in further review if the written comments provided in response to the draft application indicate that a resource agency or Indian tribe has a substantive disagreement with the developer’s conclusions regarding resource impacts or its proposed protection, mitigation, or enhancement measures. 18 CFR 4.38(c)(6). If there is no dispute regarding the applicant’s (developer) study results and draft application then go to: 7-FD-i.33 – Application for FERC License and Associated Documents. The developer must hold a joint meeting if there is a substantial dispute regarding the applicant’s (developer) draft application and study results. The developer must hold the joint meeting with the disagreeing resource agency or Indian tribe and other agencies with similar or related areas of interest, expertise, or responsibility no later than 60 days from the date of the written comments of the disagreeing agency or Indian tribe. The meeting will allow all parties to discuss and to attempt to reach agreement on any plan for environmental protection, mitigation, or enhancement measures. 18 CFR 4.38(c)(6)(i). The developer must provide written notice of the meeting to FERC at least 15 days prior to the meeting. The notice must indicate the time, place, and agenda of the issues to be discussed at the meeting. 18 CFR 4.38(c)(6)(iii).The developer and any disagreeing agency or Indian tribe may conclude a joint meeting with a document embodying any agreement among them regarding environmental protection, mitigation, or enhancement measures and any issues that are unresolved. 18 CFR 4.38(c)(7). It has complied with meeting requirements in the event of a substantive disagreement with any resource agency. 18 CFR 4.38(c)(9). A list containing the name and address of every federal, state, and interstate resource agency and Indian tribe with which the developer consulted. FERC must issue a tendering notice within 14 days of the filing of an application. FERC Handbook, page 4-11. This notice must solicit requests for additional studies. FERC Handbook, page 4-11. FERC, with the assistance of the developer, must initiate environmental review under the National Environmental Policy Act (NEPA). FERC will issue a Notice of Ready for EA after the developer files the license application and FERC has accepted the application. With the FERC-issued notice of application (see 7-FD-i.36), FERC initiates consultation with the State Historic Preservation Officer (SHPO), as required by section 106 of the National Historic Preservation Act. FERC Handbook, page 4-11. Section 106 of the National Historic Preservation Act requires FERC to consult with appropriate state and local officials, Indian tribes, applicants for federal assistance, and members of the public and to consider their views and concerns about the effect of licensing a hydropower project on historic properties within the affected area. Written correspondence from FERC requesting the correction of deficiencies or the submittal of additional information. FERC will review application materials to ensure that all required elements are present. FERC may request additional information or documents it considers relevant for an informed decision on the application even if the application complies with the regulations. 18 CFR 4.32(e)(1). FERC will review the application materials to ensure that all applicable regulations have been followed. 7-FD-i.42 – Is the Application Accepted? FERC may accept or reject an application for a license. If FERC determines that the application is acceptable following adequacy review, then they will issue a Letter of Acceptance to the developer. FERC Handbook, page 4-11. 7-FD-i.44 – Is the Application Patently Deficient? If FERC determines, within 90 days of its filing date, that an application patently fails to substantially comply with the application requirements, then the application will be rejected as patently deficient. 18 CFR 4.32(e)(2). If FERC determines that the application is patently deficient, go to: 7-FD-i.47 to 7-FD-i.48 – Submit a Request for Rehearing. FERC will issue a Deficiency Letter to the developer if the application is inadequate but not patently deficient. The developer will be given a chance to provide the necessary additional information. However, if the 24-month filing deadline has passed, then the application must be rejected. The developer may request rehearing on any decision of FERC. The developer must submit the request no later than 30 days after issuance of the licensing denial. 18 CFR 385.713(b). The request should outline the alleged error in the final decision or final order. 18 CFR 385.713(c)(1). FERC may approve or deny any rehearing request. If FERC rejects or dismisses an application because it is patently deficient or because the developer fails to correct deficiencies, then the developer cannot refile its application if the 24-month filing deadline has passed. FERC Handbook, page 4-12. The developer may obtain review of a final order in the United States Court of Appeals for any circuit in which the developer is located or has its principal place of business. The developer may obtain review through filing a written petition requesting that the final order be modified or set aside in whole within 60 days after the final action of FERC. 16 USC 8251(b). If the request for rehearing is approved, then FERC will review the decision to deny an application. See element 7-FD-i.33 — Application for FERC License and Associated Documents..
FERC must provide public notice in the Federal Register, local newspapers, and directly to resources agencies and Indian tribes if the application is accepted. The notice will identify dates for comment, intervention, and protests. 18 CFR 4.34(b). The public and participating agencies may comment on the acceptance of the application. The time frame for comments will be included in the public notice. 18 CFR 4.34(b). FERC will typically issue a Scoping Document for public comment. FERC Handbook, page 4-13. The timeframe for public notice will be included in the Scoping Document. FERC may request additional information from the developer. 18 CFR 4.32(g). FERC will provide notice of Readiness for Environmental Analysis (REA) following the comment period for the Notice of Acceptance of Application or the Scoping Document. FERC Handbook, page 4-13. Agencies, tribes, and the public will have 60 days to file comments, recommendations, terms and conditions, and prescriptions. 18 CFR 4.34(b). Evidence of waiver of water quality certification. 7-FD-i.58 to 7-FD-i.60 – Is the License Approved? FERC may approve or deny any request for a license. If the license is approved, then FERC will issue a Licensing Order. If the license is denied, then FERC will issue an order denying the license application. The developer may seek rehearing of the order denying the license application with FERC. FERC may issue an order either granting or denying rehearing of the license order. If FERC issues an order denying rehearing of the license order, then the developer may obtain review of the order denying rehearing in the United States Court of Appeals for the District of Columbia, or for any circuit in which the developer is located or where the developer has its principal place of business. The developer may obtain review through filing a written petition requesting that the rehearing order be modified or set aside in whole within 60 days after the final action of FERC. 16 USC 8251(b). Introduction, describing application date, type, and project capacity. Background, describing licensing history and current application history. Proposed operation and environmental measures. 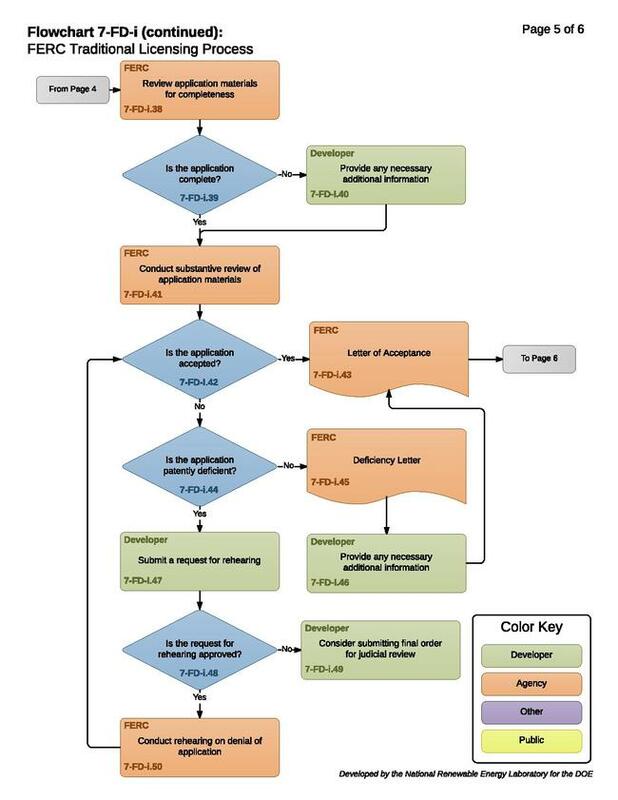 Summary of License Requirements, describing the license authorizations and requirements. Water Quality Certification, describing water quality certification and conditions. Coastal Zone Management, describing CZMA consistency certification. Section 18 Fishway Prescription, describing required fishways. Threatened and Endangered Species, describing Endangered Species Act compliance. 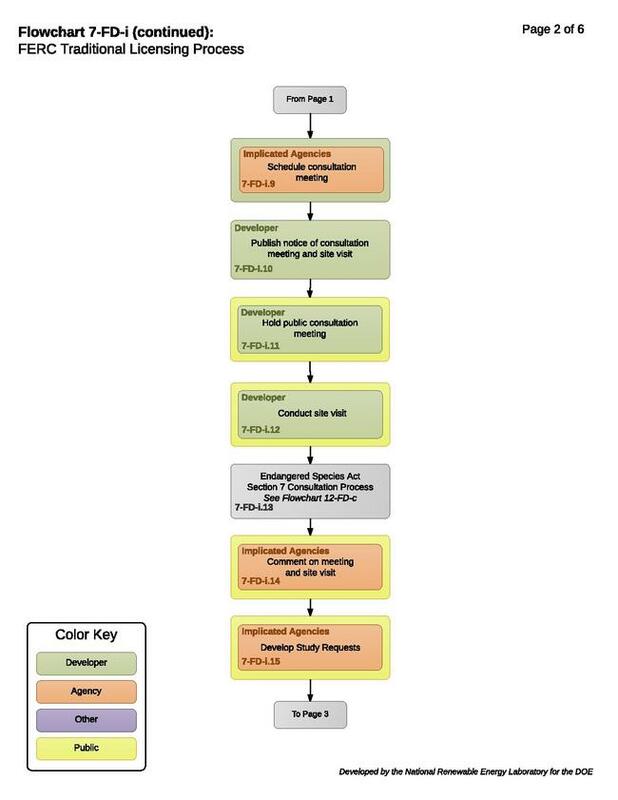 National Historic Preservation Act, describing National Historic Preservation Act compliance. FPA Section 10(a)(1), describing adaptation to conform with comprehensive plan. FPA Section 10(j) Recommendations, describing conditions submitted by federal and state fish and wildlife agencies. Administrative Provisions, describing required administrative provisions. State and Federal Comprehensive Plans, describing consistency with state and federal comprehensive plans. 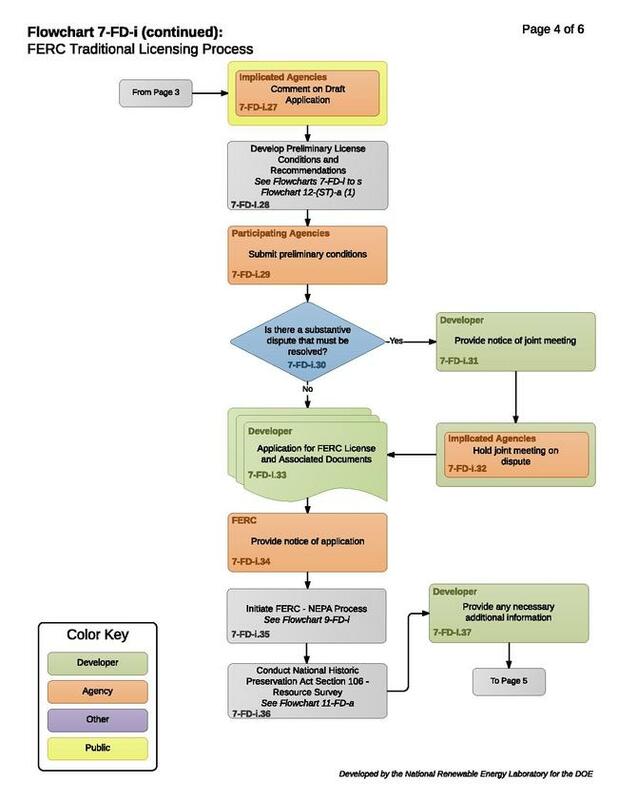 Applicant’s Plans and Capabilities, describing FERC’s analysis of the licensee’s record as a licensee. Project Economics, describing FERC’s analysis of the economic benefits of the project. Comprehensive Development, describing FERC’s analysis of the impact of the development. License Term, describing the license term, requirements, and project detail. Terms and Conditions, describing all the terms and conditions attached to the license. Appendix A, Water Quality Certification Conditions, containing an additional description of the conditions of water quality certification. This page was last modified on 15 March 2018, at 13:20.